Democrats Face Off | Kid Reporters' Notebook | Scholastic Inc.
Democratic presidential candidates applaud after the national anthem at the party’s first debate on October 13 in Las Vegas, Nevada. 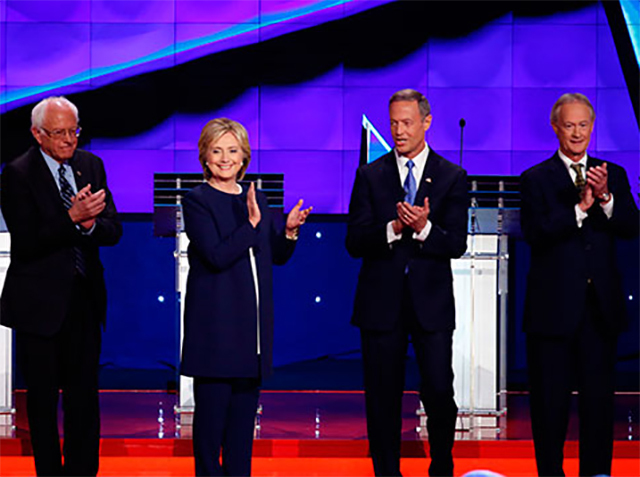 Left to right: Vermont Senator Bernie Sanders, former Secretary of State Hillary Clinton, former Maryland Governor Martin O'Malley, and former Rhode Island Governor Lincoln Chafee. As the five candidates prepared to take the stage for their first debate of the campaign season, I spoke with Antonio Villaraigosa, the former mayor of Los Angeles who now represents former Secretary of State Hillary Clinton’s campaign. “I think she’ll make a clear and convincing case,” he said of Clinton, who ran unsuccessfully for president in 2008. Soon, Clinton joined Vermont Senator Bernie Sanders, former Maryland Governor Martin O’Malley, former Rhode Island Governor Lincoln Chafee, and former Virginia Senator Jim Webb onstage to discuss issues ranging from the economy to national security. Each candidate made the case for why he or she would be a great president. Webb said that his service as a U.S. senator, a secretary of the Navy, and a soldier in the Vietnam War enabled him to understand the challenges that everyday Americans face. Villaraigosa’s prediction about Clinton’s performance turned out to be right. A HuffPost/YouGov poll found that 55 percent of registered Democratic voters watching the debate thought that she had won. Sanders came in second, with 22 percent saying that he was the best of the night. With the presidential election more than a year away, the candidates will continue to participate in debates across the country. Republicans will take the stage again on October 28 in Colorado. For Democrats, the next debate is in Iowa, where they will face off on November 14.